Featuring 12 input channels, 4 PROGRAM outputs, 4 AUX outputs and 2 dedicated Multiviewer outputs, the S3-4K is the E2 image processor’s more compact sidekick. Under the hood, however, it boasts the same processing performance, image quality, flexibility and rugged durability. In short: all the tools you need to create a stunning live experience, in a single compact and roadworthy housing. 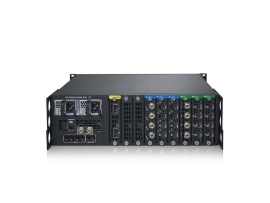 Video inputs: 12 inputs via 3 input cards (Event Master series cards) Up to 3 x 4K inputs - each input card supports up to [email protected] 4 x SD/HD/3G SDI (6G ready) 4 x HDMI 1.4a (297 Mpix/sec max) 4 x DisplayPort 1.1 (330 Mpix/sec max) Video outputs: 10 outputs via 3 output cards (Event Master series cards) Up to 2x 4K outputs - each output card supports up to [email protected] p 4 x SD/HD/3G SDI (6G ready) 4x HDMI 1.4a (297 Mpix/sec max) 2 x HDMI 1.4a for Multiviewer (297 Mpix/sec max) Optional cards available on request.